It was on a sunny January afternoon last year near their home in Michigan's Upper Peninsula that my friend Joanna's parents were out cross country skiing. They were happily swooshing along through the magical winter wonderland when in an instant, Joanna's father dropped dead into the snow. In that same instant, Joanna's life was painfully, unpredictably and irrevocably changed. Her father was gone. Snapped away in an instant and sent straight to heaven, no doubt. And what was left behind to fill his enormous place in her life and in her heart was grief. I'm not talking about "Take a few days off till after the funeral and here's an extra box of tissues tut tut you know he loved you dearly" type grief. What Joanna experienced was a kind of grief that overwhelmed her mind, shattered her heart, and seared her very soul. Some days she wept endlessly..
And despite her profound passion for running her own care-giving business, some days she simply could not bring herself to get out of bed and go to work. And this was not some two-week crying binge. As the days rolled into weeks and months, this grief settled into Joanna's life, some days allowing her to function almost normally and other days drowning her in a sea of sorrow. To be sure, Joanna received lots of support from family and friends. Her husband and young daughter especially loved her and cared for her and accepted her intense grieving without question. Joanna's faith was strong and she knew God loved and cared for her dad and for her too. But the grief did not let up. Hungry for understanding, Joanna decided to learn more about grief. Digging into the internet, she read and shared and shared and read. I eagerly pored over her posts, and the message I took from them sounded like this. Joanna found comfort in those ideas, and they helped her cope. Now, here comes the interesting coincidence. A few years earlier, Joanna and her staff had cared for my mother during a crucial season in my mother's battle with Lewy Body Dementia. During that time, Joanna helped me to find new insights into my mother's illness and taught me how to walk alongside her with peace and calm. Joanna played a key role in helping me find the gifts of my mom's deterioration, and with her guidance, I found much light and love in the midst of that terrible disease. And now with her dad passing just three months after my mom, Joanna was opening my heart and mind to a new understanding of grief. But here was my struggle. My grief was nothing like Joanna's grief. Rather than crashing waves of overwhelming emotion and physical pain, my grief was the tiniest of ripples on a small, still pond. 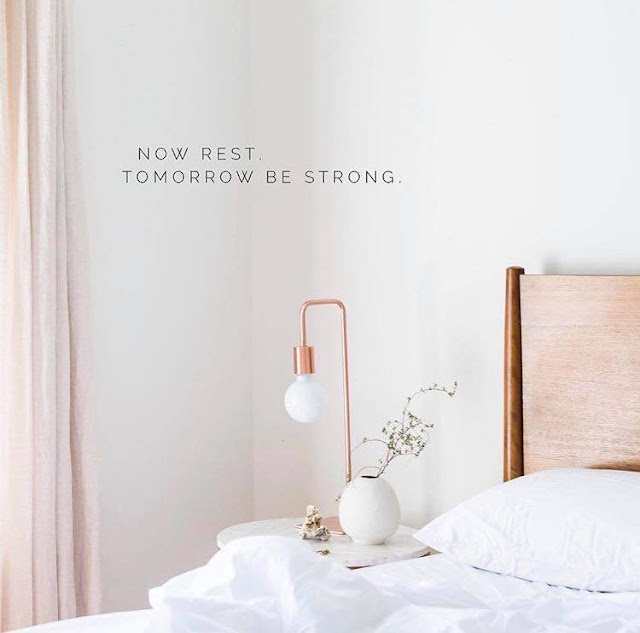 Rather than disrupting my daily work routines and dropping me into an exhausted heap of tears, my grief was a quiet hum that kept me quietly going about my business. Rather than aching from the absence of my mom, my grief was lit with thanksgiving and relief that her long ordeal was over. Rather than longing to take care of myself, my grief was soothed when I took care of others first. All of this was extremely different from what I'd been learning about grief. And I could not help but think I was doing something wrong. I worried that I was in denial about my grief. I worried that I didn't have any grief. 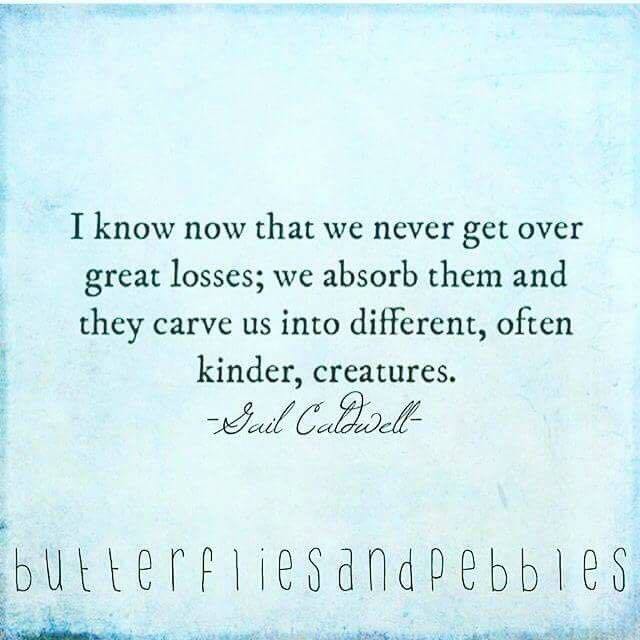 Grief can be brutal...or it can be gentle. 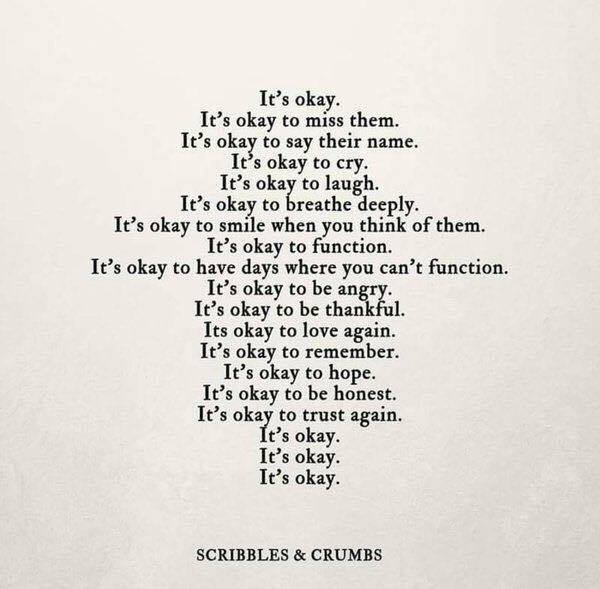 It's okay to not be okay...but it's okay to be okay too. 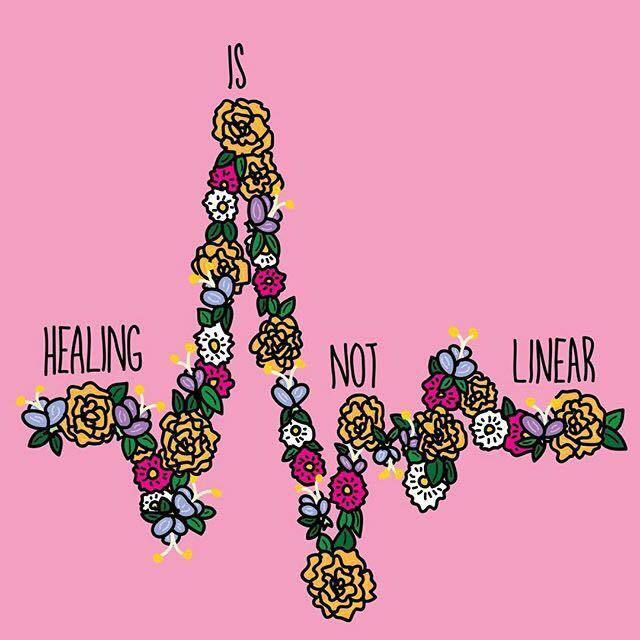 Take care of yourself...whatever that means to you. And now I was able to cope. What I understand now is that grief is as individual as a fingerprint. Grief can be a raging storm or a single raindrop, or anything in between. Grief can be a howling wind that turns you upside down and inside out or a quiet whisper, or anything in between. Grief can turn you inside yourself and slam shut all the windows and doors or it can move you out into the world with your arms open wide, or anything in between. What Joanna taught me about grief is that there is no one way to grieve, there is no wrong way to grieve. 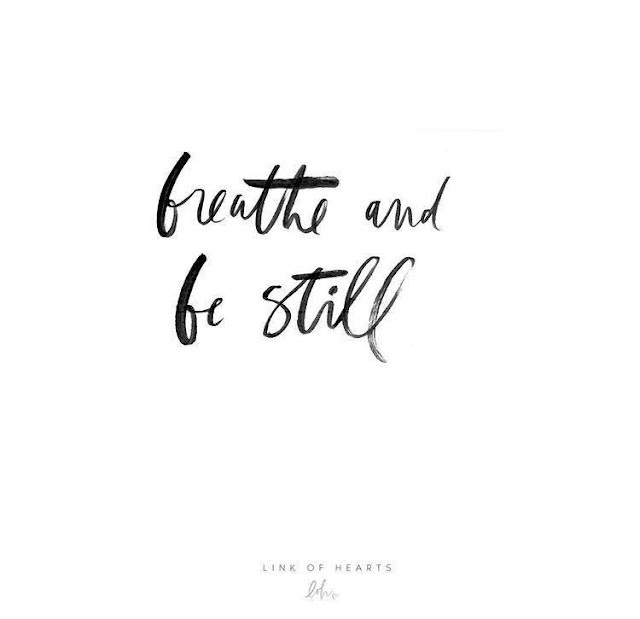 All that matters is that we open our hearts and minds to our grief and let it have its way with us, so that we can learn and grow from our loss. That was beautiful. Thank you for sharing with us all.